The majority of us grew up with the magic of Disney cartoons and films so it is only natural if we want to bring a bit of the whimsy into our home. No matter how old you get, Disney films are still able to enchant you with their awesome tales. 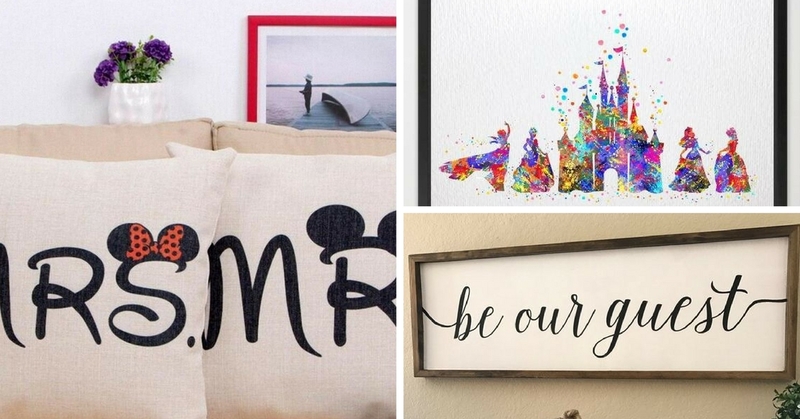 Bring some of the wonder of Disney into your home with these cool decor. Dress up your pillows with this cute pillow cases that isn’t too overwhelming but provides the perfect Disney touch in your home. The muted neutral colours blend in well with any decor. Let Mickey Mouse bring in the light to your home with these curtains that are both cute and pretty. Paired with a matching wall and windows, they look really stylish. Hang up this beautiful illustration of iconic Disney figures in your home for a magical and beautiful look without overwhelming the rest of your decor. Be inspired by the whimsical art! The welcome mat is the first thing your guests will see and adding a Disney inspired touch to it will make it all the more welcoming. That signature font is bound to bring all those happy Disney memories back. Make your guests feel even more welcome with this iconic quote from Beauty and the Beast hanging up in your home. To top it off, the beautiful rose in a glass enclosed case works wonders.